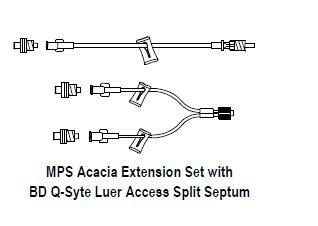 An FDA press release stated that Acacia Inc. voluntarily executed a product recall of certain lots of IV Extension Sets with BD Q-Syte™ Luer Access Device. The BD Q-Syte™ Luer Access Device is a Needleless Valve manufactured by BD (Becton, Dickinson and Company). The IV Extension Set with BD Q-Syte™ Luer Access device is intended for use with other infusion therapy products in the administration of fluids into the intravenous system. Use of the affected BD Q-Syte™ Luer Access Device may cause an air embolism or leakage of blood and/or therapy, which may result in serious injury or death. The recall was initiated on Dec. 18, 2009 after Acacia received information from BD of complaints received due to air entry through the bottom disk of the Q-Syte™ septum. BD investigated and determined the root cause to be a manufacturing deviation. The root cause has been corrected by BD and preventive measures, including additional inspections and preventive maintenance of the line, have been implemented. For more information about the voluntary recall, click here. In addition, BD has voluntarily executed a product recall of certain lots of BD Nexiva™ Closed IV Catheter Systems. For more details, click here. IV drug pH – a closer look!